ONLY A COUPLE OF MONTHS AGO, THE (SO CALLED) LEADERSHIP of the stalwarts from the land of the birth of modern finance and capitalism, namely the money streets of London, seem to show the way to the world, yet again. Leading economists from across the Atlantic cried to pay attention to the novel strategy through which the Britons claimed to wager a turnaround of the global financial crisis: by partnering the financial institutes and banks, not just bailing them out. Today, Reuters shows the data declaring that Britain is officially under recession [See Right. Source: Reuters.com]. Now, there doesn't seem to be a consensus on why this happened in spite of all that happened. Nobody seems to be knowing what's going on, where it came from, taking us where. And apparently, Taleb would be having a laugh. But loosing Sterling suddenly could be much harder than the steady weakening US Dollar - it would probably mean that the hedge would become the target; cover is blown. When George W. Bush assumed office, he had security crisis falling into his lap almost immediately (9/11) in 2001. The new president in 2009 has the financial crisis to grapple with from day one in the Oval office at the White House. Perhaps the only advantage (if one would want to call it as such) that President Obama might have is the foreknowledge of the crisis he and his country would be entering into. How much that knowledge goes to help him and America, and the world at large, only time would tell. when one is in hell. 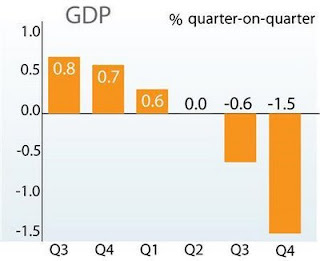 Go here for the Reuters data of 23 Jan 09 - Britain slips into recession. Go here for the above footage on YouTube.